Recommended to me by the rather lovely Jamilla from MakeupForProfessionalAsianWomen as her salon uses it to nourish her cuticles. I’m always on the lookout for cuticle softeners (it makes nail painting SO much easier if your cuticles are in good shape) I couldn’t resist picking up a bottle to try. Almonds, marzipan… gawd I could drink this stuff. Though I don’t recommend it. It’s been 3 days and I’ve swiped the brush around my cuticles about 9 times maybe and I’m starting to see a huge improvement. 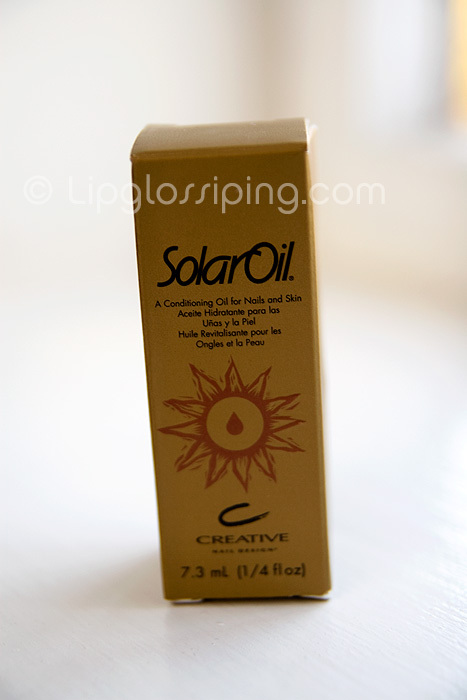 The thing I like most about the CND Solar Oil is how well it absorbs… taking just a few minutes of massaging into the surrounding skin before I can get on with whatever I was doing previously. By contrast, my LUSH Lemony Flutter takes a good 10 minutes, by which time I’ve usually grabbed a tissue and wiped most of it off. Time will tell if it’s as effective as my usual methods… but I’m already fairly condident that it’s outperforming. What do you use to nourish your nails? I’m a fan of it too. I’ve been on the look out for this as a replacement for my Lemony Flutter. I used to use this years ago when I had fibreglass nails and its beautiful. I’m surprised you’ve had such problems with Lemony Flutter, I love it and find it absorbes very fast but I don’t use much. The only reason I am replacing it with something different is that I just love change! i’ve only ever tried LUSH Lemony Flutter Cuticle Butter for my cuticles, but I’ve heard good things about this stuff, so maybe I will give it a try when I’m a bit lower on my LUSH butter. Ahah! i’m finally learning some of your fabulous nail secrets. not to just figure out how you apply the polish so perfectly smooth. I use LUSH lemony flutter and someone suggested keeping it by the kitchen sink, then applying it before doing the washing up. You put on your rubber gloves, wash up and hey-presto, it’s absorbed! It really works as well. loving the sound of that!!! and it’s so affordable too. I am also addicted to this. I have a 68ml bottle that cost approximately £20, and it lasts forever. Thoroughly recommend purchasing a larger bottle economy wise!